Saturday, May 10th 2014, four o’clock p.m. Unusual things are happening at the Leipzig University of Applied Sciences. Showcases are filled with old gaming-technology, video games and classic merchandise. The entire evolution of Game Boy development is on display, as are classic video game magazines or gaming-related sculptures. The corridors are filled with old SID chiptune sounds, a program announces an upcoming C64 concert later in the evening, and hundreds, even thousands of retro-interested visitors roam the hallways. Dozens of gaming stations have been set up, showcasing not only classic and concurrent games alike, but also modern reinterpretations of old hits, new homebrew games for classic consoles and much, much more, since there are also many events and lectures for the interested visitor. A field has been set up for robots playing soccer. A talk about the SNES will take place at around midnight. And three video game tournaments are looking for the most skilled players in their respective fields. One of these is set up on the second floor, in room 209, right next 16-player Faceball 2000 setup on classic Game Boys. Here, the eighth German Mega Drive Championship is about to commence. After Nuremberg, Hanau and Munich Leipzig has become the fourth city to host the championships. Never before had the surrounding event been so huge though. The Long Night of Computer Games had over the years grown into one of Germany’s biggest Retro Computer Events, and more than 2.500 visitors have journeyed there this year alone. It’s no wonder then that this year’s Mega Drive Championships also became the biggest tournament to date. 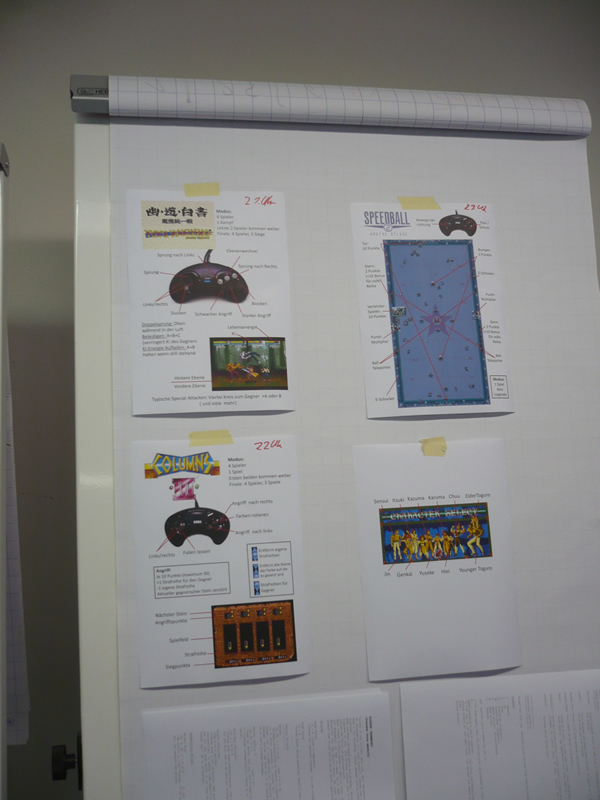 40 competitors challenged one another over six different categories to determine the best Mega Drive gamer there is. This was a new record, even though (or especially since) all players were newcomers to the event, which was interesting, because the games of the tournament had been determined by past participants. But even though several “veterans” had announced their interest of taking part again, none had managed to make a return appearance. Nevertheless, the large roster alone made for another exciting evening. As a relatively small part of a much bigger event, the organization had to be handled a bit different than in past years. The tournament therefore took place in a dedicated room filled with SEGA consoles. Not only had competitors the opportunity to train the tournament games on a few dedicated Mega Drives set up specifically for that purpose, but onlookers and passersbys could also try their hands on classic games for the Dreamcast, the Saturn or even the old Master System. Games like Ecco the Dolphin or Saturn Bomberman definitely radiated charm, and the organizers made one curious, if not too surprising observation: all through the evening, there was always at least one person playing some incarnation of Sonic The Hedgehog, no matter whether it was on the Master System, the Mega Drive or even the Dreamcast. The room was a meeting place of generations, not only console-wise. Visitors ranged from age seven to age 40, and each and every one enjoyed the consoles on display. This year, not only the game stations drew a crowd. The prices were also pieces of particular interest. As a main attraction, the first price this year was a SEGA Dreamcast, complete with control and one very special game: Sturmwind, a brand new shmup released only last year. Needless to say, this drew quite a few curious onlookers, and comments like “May I touch this?” could be heard all through the evening. As has become tradition, the tournament started with a blast. At six o’clock p.m., the first category commenced with a four-player tournament in Mega Bomberman. As usual, this game drew a decent crowd of onlookers. In fact, had this particular game taken place hours later, chances are the crowd, as well as the number of participants, would have been quite a lot bigger. As it were though, even though it was relatively early in the evening, the opening act was quite a crowd-pleaser. 16 players, cheered on by a crowd of at least 20 spectators, battled viciously for the victory. The explosive final match, in which the players called Apprentice and Darkspine fought hard for the win, even had to go into overtime and was one of the early high marks of the tournament. Apprentice eventually claimed victory and thus left his mark on the tournament from early on. The explosive heat in Bomberman was followed up by a few comparatively quick and relaxing rounds of Sonic 3, which for the first time replaced its predecessor Sonic 2 in this kind of tournament. The short and fast duels were very enjoyable, though a bit lacking in surprises. The following third category was pretty much the opposite, however. The racing matches in Micro Machines 2 were very popular, and not only among veterans of Mega Drive gaming. Many visitors who weren’t very familiar with Sega’s old 16-bit warhorse were nevertheless enjoying the heat of the races. Therefore, the game drew many additional spectators which were soon filling up the room. And all this even though the organizers of the championships had decided against multiplayer matches. Due to time constraints, the decision was made to keep Micro Machines as a series of duels only. This didn’t stop the event from being very cheerful and exciting, however. The biggest crowd-pleaser was yet to come. The fighting category had originally been scheduled with the game Super Street Fighter II in mind, but there had been a small change of plans a few weeks before the event. At the Long Night, parallel to the Mega Drive Championships, there was also a dedicated fighting tournament going on. To fit in the retro theme, this tournament had also planned on taking on Super Street Fighter II. In order to prevent confusion, the organizers of the Mega Drive Championships had therefore decided to switch the game and mix things up a little. As a result, the fighting category was now sporting the relatively obscure, Japanese exclusive fighting game Yu Yu Hakusho: Makyo Toitsusen. Even though hardly anyone present was familiar with the title, within minutes it became a hit amongst onlookers and participants alike. With 27 competitors, this event became the category with its largest number of individual participants to date. However, at this point in the tournament it also became apparent that the usual championship mode was not very suitable for such a big event as the Long Night. With many parallel lectures and other programs going on at the same time, it was difficult to keep the interest in both spectators and potential players going for the entirety of the event, and near the end of category four (of six), the tournament began to lose steam. While the fighting category was still going on however, it was accompanied by loud cheering and excited battles. seven-year-old Maxi, the youngest player in the championships, also fought along with fervor and managed to reach the quarterfinals, even though he was surrounded by competitors twice his size and four times his age. It was a very remarkable experience for all involved. Yu Yu Hakusho definitely marked the high point of the tournament. Afterwards things became calmer, the numbers of category players dropped from 27 to merely 16 for the puzzle game Columns III. Nevertheless, thing remained exciting. A clear-cut top four had managed to distinguish themselves from the rest of the playing field, with two participants in particular battling for the title. Sebastian Bulka had managed to score a win in both this and the previous category and was merely 1.5 points behind the leading man, Apprentice. So when the fifth out of six categories had finished, the tournament was still undecided. The final category would determine the victor. This year, the closing category was sports. Somewhat surprisingly, Speedball 2 had been elected by tournament veterans to represent this kind of video games at the tournament. 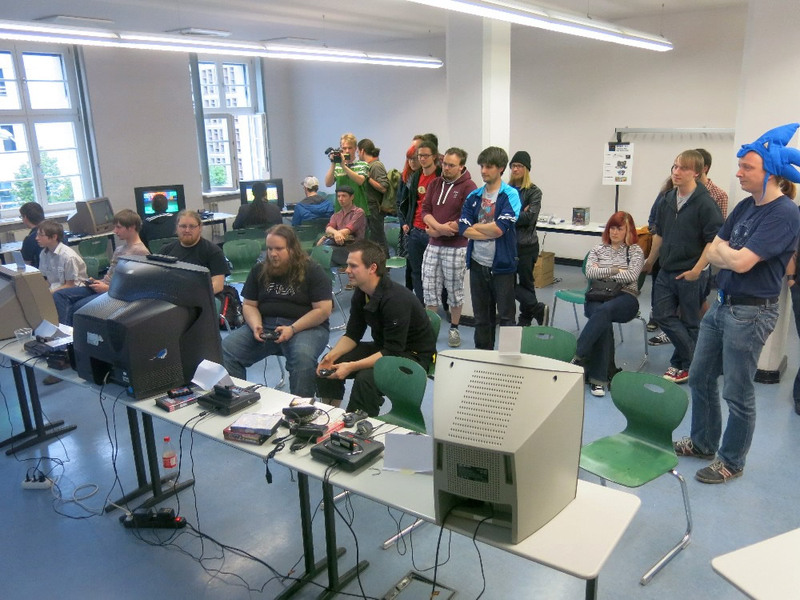 Of the overall roster, only eight players had stuck to their guns and participated in all games of the championships, though 16 had played in at least half of the events, which is pretty much average as far as German Mega Drive Tournaments go. Nevertheless, the sports category shook things up again. Many fans of this classic 16-bit game who knew it from its home computer roots, dropped by to join this single event. This resulted in a decidedly different outcome when compared to previous categories. With Aiunier, the sports category thus saw a winner that had previously not taken part in any of the other games of the tournament. The outcome therefore wasn’t decided in the finals but rather in the previous rounds of this category. In order to win, Sebastian Bulka had to surpass Apprentice by at least two rounds. If Apprentice would be defeated in the quarterfinals, Sebastian would at least have to reach the finals in order to become champion. Interestingly enough, the draw had resulted in a possible meeting of the two in said quarterfinals, which would have been the decisive match of the tournament. However, this was not meant to be, as Sebastian lost his very first match against N3Cr0 and thus forfeited any chance of claiming the title. Ironically enough, Apprentice would continue to defeat N3Cr0 and managed to reach the semi-finals. With a relatively secure lead of 3.5 points, Apprentice thus managed to claim the title of German Mega Drive Champion, the fifth person to do so. The tournament concluded by midnight, after roughly six hours of excited matchups. The Long Night, however, lasted much longer, until three o’clock a.m. So even though Mega Drive Gaming had mostly concluded for the night, gaming in general was still going on for hours. The University still had many more interesting setups on display, like a dedicated eight-player stations of Daytona USA, for example. In such surroundings, the tournament came to a very satisfying conclusion. With such an event framing the championships, and with that many people, players, spectators and supporters alike, it shows the glorious 16-bit days, and Mega Drive Gaming in particular, still have a nostalgia-powered future here in Germany.